ALL COPYRIGHT©since 1991 reserved by the artist. No image may be reproduced or altered in any form without express permission of Kirby Sattler. 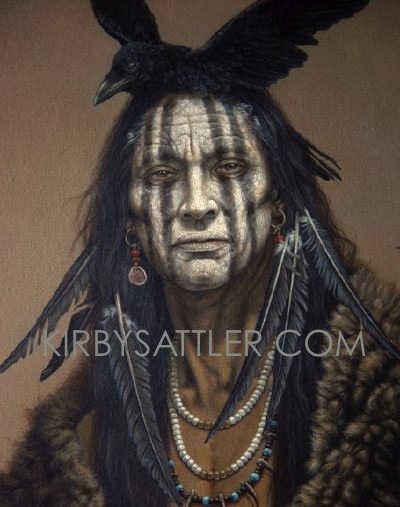 The use of any Kirby Sattler image is restricted to non-profit, non-commercial, or educational purposes, pursuant to express written authorization from the artist. To request the image use, email copyright@kirbysattler.com stating your full name, contact number, the intent of the image use, website and/or organization. Kirby Sattler art images are prohibited to be used as animation, electronic greeting cards, graphics sets, printed or electronic stationery, signatures, signature tags, tubes, tutorials, web sets, wallpaper, etc. and on any public image exchange web sites such as "Photobucket" "Flikr" "Cafe Press" "Deviant Art" "web shots" or postcard sites. Hot linking is strictly prohibited. All images approved for website use must include a link directed to sattlerartprint.com and credited as "Painting by Kirby Sattler". Each image must contain watermark such as " I Am Crow" below.